Here are ideas for creating and leading sessions at an unconference. These are interesting ways of organizing the time and structure of the session to explore a question, or set of questions. The following formats are described: Fish Bowl Dialogues, Knowledge Café, World Café, Lightening Talks, Speed Geeking, and Formal Presentations with Participation. These can be mixed and matched with the content and visualization ideas, below. This format can be used to explore a particular question or set of questions. Set up a circle of 5-8 chairs in the center of the room. Have additional rows of chairs (with 4 aisles) radiating out for the center. The basic idea is that the center group engages in a discussion, while the outer group listens, but then rotates in. Those in the center circle can either be selected or volunteer from the group. You may want to start out with a group comprised of people with different opinions on a topic, or different areas of experience. Or you can let the group form as it will. In most Fish Bowl Dialogues, there is one chair left empty in the center circle. This chair is open for someone else to step into. When someone steps into the empty chair one of the existing center circle people should self select and step out so there is always one empty chair. Heterogeneous Fishbowl: This form lends itself to an issue with a variety of viewpoints or roles. One representative from each main viewpoint/role is invited to sit in the center group. When someone new wants to occupy the chair for a particular role, they sit behind the person currently in that role, who then rises and vacates the chair. Homogeneous Fishbowl: People group themselves according to categories – e.g. “qualitative evaluators.” One group sits in the middle and discusses the topic at hand; then people in the next category go into the middle while the previous group sits out. Having two or more rounds for each group allows for more depth and responsiveness. This form can also be used to explore a question or set of questions. The knowledge café begins with the participants seated in a circle of chairs (or concentric circles of chairs if the group is large or the room is small). The facilitator introduces the café topic and poses one or two key open-ended questions. Then, the group breaks into small groups, with about five people in each group. Each small group discusses the questions for about 45 minutes. The small group discussions are not led by a facilitator, and no summary of the discussion is captured for subsequent feedback to the large group. Participants then return to the circle and the facilitator leads the group through the final 45 minute session, in which people reflect on the small group discussions and share any thoughts, insights and ideas on the topic that may have emerged. A knowledge café is most effective with between 15 and 50 participants – about thirty is ideal. This format is similar to Knowledge Café, except that there are two to three rounds of small group discussions, with the groups breaking up and new groups forming in each round. Rounds typically last 20-35 minutes. In between rounds, one person stays at the same location to be “table host” and welcome travelers. Table hosts are not experts or facilitators, simply volunteers in the moment. Facilitator may ask for highlights to share with the whole group between rounds, or wait until all the rounds are completed. The questions may change with each round, or the groups may stay with the same question and go deeper. See http://www.theworldcafe.com for more info. All three refer to similar formats. For Lightening Talks, most conferences will assign a slot (30 to 90 minutes) and arrange several talks one after the other during the session. The length of the talks is limited (between one and 10 minutes). Slides are sometimes discouraged to allow rapid changes between speakers. For Pecha Kucha nights, there are usually around a dozen presentations, each presenter having 20 slides, each shown for 20 seconds on a timer. Thus, each presenter has just 6 minutes and 40 seconds to explain their ideas before the next takes the stage. An Ignite talk is also 20 slides, but the slides are automatically advanced every 15 seconds, so the total time for each talk is 5 minutes. This format works best with a large room. Presenters are arranged in a large circle along the edge of the room. The remaining members of the audience stand at the center of the room. Ideally there are about 6-7 audience members for each presenter. One person acts as the facilitator. The facilitator rings a bell to start proceedings. Once proceedings start, the audience splits up into groups and each group goes to one of the presenters. Presenters have a short duration, usually 5 minutes, to give their presentation and answer questions. At the end of the five minutes, the facilitator rings a bell. At this point, each group moves over to the presenter to their right and the timer starts once more. The session ends when every group has attended all the presentations. If you have a big, well-developed idea you may want to prepare a short or longish formal presentation, and plan time during the session to involve the audience. For example you can ask audience members to pair up or form small groups to reflect on the presentation topic, possibly with specific questions, and possibly with reporting back. You can ask pairs to interview each other (and signal a halfway point so the interviewer can be the interviewee). Or you can adapt one of the other format ideas for part of your session to generate discussion and interactivity. This addresses different ways to think about what you are going to talk about or address during a session. Included here are Imaginationfest, Show and Tell, Learn How to Do X, Birds of a Feather, and Storytelling. These can be mixed with format options. This form works well when what is desired are imaginative flights of fancy in response to a question. The set up can be any of the above formats. For example, what would an ideal RFP look like, or what is the future of evaluation. The group then brainstorms and collaborates on the outcome. A BoF session is an informal gathering where attendees group together based on a shared interest and carry out discussions without any pre-planned agenda. What led you to decide to come here today? What hopes do you have for this event? What early experiences helped shape the values you hold now? Many people have, within their general approach to an issue, some dilemmas, mixed feelings, uncertainties, or gray areas. Are there any dilemmas, value conflicts, or gray areas that you have on this issue that you’d be willing to share? What is the most effective action you ever witnessed regarding (issue)? What do you think made it work so well? How did it inspire you? Some of the questions above are drawn from an excellent resource for dialogue, the Public Conversations Project. Their guide book is available for free online; see www.publicconversations.org. These help spark reflection and conversation by visually depicting the participants thought processes. These ideas include Dotmocracy, Kenetic Spectrum, and Community Mapping, and can also be mixed in with other formats. The idea is to get people to position themselves based on their opinion or position on a particular topic – to visually show the where the group stands, and to invite reflection and dialogue. You begin by introducing a statement that you know people will have opinions about. This should not be something everyone agrees or disagrees with but something with some friendly contention in the community. There is a masking tape spectrogram on the floor with a middle marked. One end will be for ‘agree’ the other end for ‘disagree.’ The middle is neutral or don’t know. Alternatively the lead in can be a question to which people have a range of responses. The leader reads the question out and invites the people in the room to spread themselves out physically along the line. Then the leader or others can interview people about why they are standing where they are on the line. A variation is to fold the line at the halfway point, pairing up the two people at the extreme ends and so on down the line (until the middle people are paired with each other), and then ask the partners to have a short conversation about why they feel the way they do. Using large paper, the group creates a map of some aspect(s) of a community. It could document critical milestones or events in the development of the community, or a map of how people and/or projects are related to one another. Don’t feel that you have to “fill” up the entire session timeframe. If what you have to say only takes 15 min and the group has finished interacting–then the session can end. 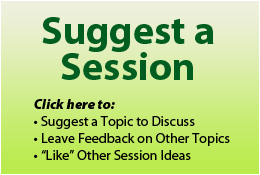 Don’t feel pressure to limit the dialogue to the session timeframe. If you think it would be productive and beneficial to continue your session, try to find a way to facilitate this. You might be able to keep talking for a while in the room you are in, or move to another part of the conference area, or post “Part 2” on the agenda. Experiment with the kind of sessions you lead. There is no such thing as “failure” at an unconference. Any ideas on how best to maximize the impact of the benefits of sound environmental evaluations to decision makers. Given that many countries are in recession or simply cutting back many environmental programs and/or even having quality assessments is in jeopardy. The ideal triangle balancing social, economic and environmental dimensions is being distorted towards the economic apex. But good environmental actions do pay-off! Can folks share some of these successes or successful approaches that have caught the attention of their decision-makers.